OneMama.org serves on behalf of Women’s Intercultural Network for the United Nations Women’s Commission on the Status of Women (CSW). UN Women CSW is the principal global intergovernmental body dedicated to gender equality and the empowerment of women, which holds an annual event with leaders representing all regions of the world to amplify its message. Currently, the CSW’s chief goal is to achieve 50/50 gender equality by 2030. In working with UN Women, OneMama,org relays the concerns, frustrations, and realities of women in the communities we serve to directly impact international policy decisions. 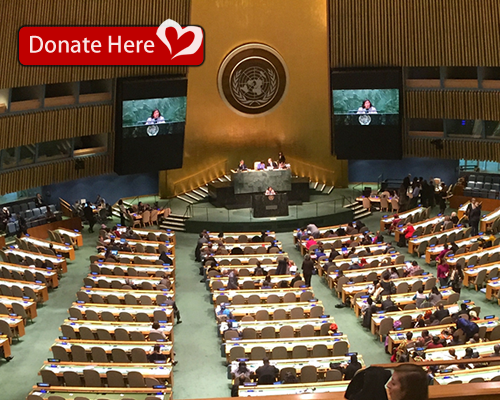 OneMama.org also hosts its own event annually at the United Nations CSW, Global Funding Solutions for Nonprofits. This event facilitates a discussion on the innovative solutions being implemented by organizations and people to create global change. Click here to read more about OneMama.org's annual event at the UN. Click here to view images from OneMama.org's panel at the UN.